Summary: The description, specs, pricing, photo and user ratings for Freedom Arms’ Single Shot pistols. Freedom Arms‘ Single Shot is a single-action, single-shot pistol built with stainless steel with a matte finish. The grips and forend feature impregnated hardwood; you can get short or long versions of the forend. 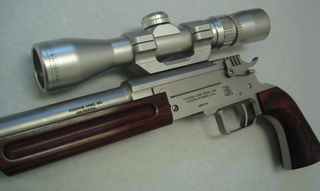 a drilled and tapped barrel for a scope or red-dot sight mount (silhouette sights are available on some barrels). polish and jewel the hammer and trigger. .357 Magnum 1 14.75″ 10″ 3.94 lbs. This entry was posted in .223 Remington, .260 Remington, .308 Winchester, .338 Federal, .357 Magnum, .357 Max, .375 Winchester, $1,251-$1,500, 6.5x55mm, 7mm BR, 7mm-08 Remington, Freedom Arms, Full size, Hunting - Big Game, Single shot on January 26, 2011 by Staff.